Corrine's Paper Crafts: Two Terrific Shirleys! Hot on the heels of Paula and Chris, Shirley and another Shirley were next to be good enough to show us their makes for ‘Peek Of The Week’. A big Thank You to both of you, it’s great that you took the time to post. The first Shirley showed us a beautiful ‘New Baby’ card she had made. She explained that she’d used acetate to suspend both the aeroplane and the train, and very effective it looks too. As if this detailed and intricate card isn’t enough, Shirley also made the presentation box in which it is displayed. 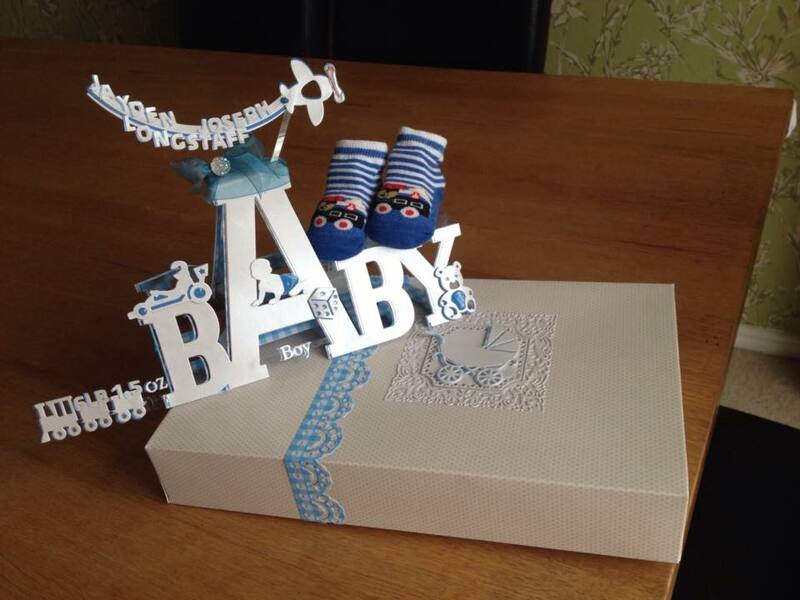 The card is made with the baby die from the Tattered Lace Monumental range. What I love about this card is that it’s so personal, complete with baby’s name and birth weight. It’s a unique, stand out card that the parents will treasure for a very long time, and the matching presentation box is the cherry on the cake! Next up was the other Shirley, who showed us her Christmas wall hanging. I like this; it’s different, and obviously a lot of thought has gone into it. Shirley’s wall hanging uses Tattered Lace dies to make the floral elements. Shirley explained that this is the very first thing she made for the Tattered Lace Design Team, and she loved making it. She also loved seeing it on TV as that gave her the satisfaction of knowing other people saw it and liked it too. Well done Shirley! This is really eye catching. It’s a delightful vibrant wall hanging with lovely Christmas colours, the sort of Christmas decoration you just can't buy. Shirley and Shirley, a sincere Thank You for taking part in ‘Peek Of The Week’ and please keep the pics of your makes coming. I look forward to seeing more crafters joining in and posting their photos on my Facebook page… as I keep saying, the more the merrier! Take A Bow, Paula and Chris! Christmas... When Do YOU Start To Prepare?